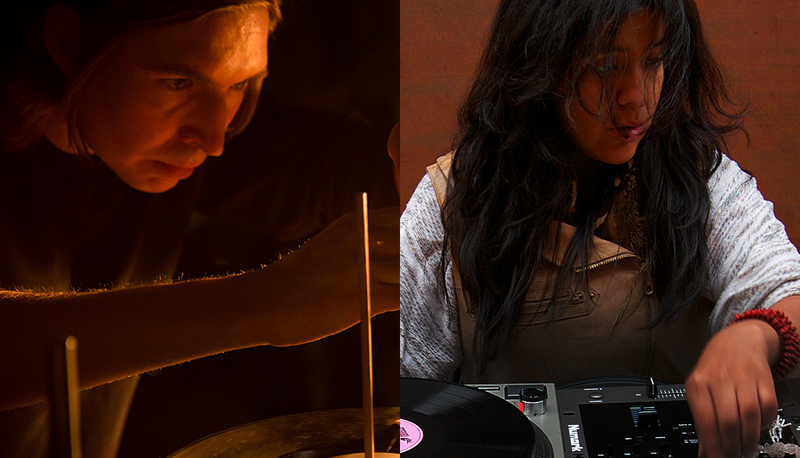 As music technology advances, a growing number of artists are exploring what it means to go “off the grid” and making their own transgressive Frankenstein instruments. Far outside DAW quantization and the digital realm, sound artist Graham Dunning uncovers what the unpredictability of the physical world can do for dance music with his sound experiments. Perhaps his most well-known is the Mechanical Techno Project, which uses turntables as the basis for towering contraptions that make techno music with no human involvement. They spin multiple records on the same axis and use nuts and bolts to trigger external effects, elevated planes to create rhythmic patterns and metal-plated locked grooves produce unpredictable noise. The setups are clumsy, inaccurate and prone to error—in other words, they’re not computer perfect. And that’s entirely the point. Likewise, there’s nothing accidental about the accidents in Maria Chavez’s music. An abstract turntablist from Peru, her work values the improvisatory power of the fluke. She deliberately performs with broken and damaged needles — which she calls “pencils of sound” — that develop their own unique shape and sonic profile from her physical playing style. We connected Chavez and Dunning for a wide-ranging conversation on improvisation in a time of digital rigidity. Maria Chavez: I started DJing at raves and parties when I was 16. My mom was traveling out of the country quite a bit when I was in high school, so I just needed to be home at 6 p.m. to get her phone call and then the nanny would let me do whatever I wanted on a school night. I had my own DJ company by the time I was 18 and by the time I was 20 I was really burnt out on rave culture. I didn’t like the way women were being treated in the DJ scene, and creatively it wasn’t giving me the inspiration I needed. I was producing tracks but I didn’t really know what direction I wanted to go, so I started getting interested in the avant-garde. How did you get started? Graham Dunning: I was playing bass guitar in a band when I was about 15. It was very DIY—we taught ourselves, and then my music teacher allowed us to borrow a four-track for the summer. That was a real education in recording and studio techniques, but it never took off how I wanted. I feel like a bit of a dilettante because I’ve done a bit of everything; I used to DJ, I put club nights on in Manchester and I played different roles in different bands. For a couple of years now I’ve been doing the Mechanical Techno Project. It started as a studio project, a way of recording repetitive electronic music in the studio and making it a bit more organic by not having it all on the computer. I wanted the sequencer to be a bit wonky to allow unpredictable elements, which I guess is a lot like in your work. MC: Yeah, but you’re a lot cleaner! Many turntablists need everything to be controlled and sliced and placed, and the rhythm has to come out. That’s a characteristic of turntable art that drives me crazy, because it’s almost too focused on mechanics and doesn’t allow for the destruction of the mechanics. It’s all about control. Techno is electroacoustic sound quality in a controlled environment. Do you sit or stand when you improvise? MC: When students use my book on turntablism for their final projects and request feedback from me, I’m like, “Tell them to sit down! Stop standing!” It’s to hone in and focus on what you’re doing. When you’re standing, there’s too much opportunity to move around. GD: Because I’m coming from playing drums, I feel my physicality and the physicality of the machine are both important. So I think I would feel restricted sitting down. MC: You should feel restricted! That’s what I say to people: if you feel like it’s stopping you from doing something, do it just to see where it takes you—even if it proves you right! But it is restrictive. I tried to perform with one turntable while standing, and it drove me insane. It didn’t give me the kind of focus that I needed. But also, my sound pieces are a lot more about acute listening. I’m not really doing tricks. It’s a more organic, improvised sound sculpture with just one turntable and one needle, whereas a lot of other turntablists who use multiple turntables are just managing mechanics. There really isn’t space for a piece to unfold because they’re just managing all of these different components and aren’t able to hone in. Do you find you can still hone in when doing your mechanical techno stuff? GD: The thing is, if you leave the machine running, things will inevitably go out of sync. With the mechanical turntable machine I made, it feels like playing with someone else or performing a live dub. It’s more like the process of doing a dub mixdown than playing a live instrument; it’s more about using the inputs and outputs to compose a piece rather than actually playing it like an instrument. MC: I think I saw a pedal on your machine. I’m a purist, so I think if you’re not doing it with your hand, you shouldn’t be doing it. But your video got more hits that mine. How was making that video? I found it really exciting. GD: With the vinyl revival, the price of records has gone up loads, and many are worth more now than they were ten years ago, and at the same time, every junk shop has hundreds of worthless records. The high values are a fallacy, and it’s fascinating how it relates to what’s happening with the music industry: this big panic over digital sales, and now a big swing back to physical records and artifacts. But as they become more produced, they then go out of fashion, because music and fashions change and these things get left by the wayside. I think it is very interesting. What are you buying when you buy a record? MC: I guess you’re buying a tangible experience, and I loved that. The industry took something away with the idea that now everything can be stored in the cloud. Everyone got so excited and threw away all of their CDs. Now it’s come full circle back to tangible things. There’s also a big cassette movement. You release on cassette, right? GD: Yes. I really like the cheapness. It’s nice to be able to put out a short run of tapes to sell at gigs or swap with other musicians. I’ve produced a few tape series that were recorded sequentially rather than consecutively and had unique handmade covers. I try and make things that I would like to collect, which aren’t necessarily going to be really slick or professional. I have a collection of found cassette covers that people made for copied tapes. It’s great to see the amount of care and time that went into something that only they or their friends were meant to see. MC: I love that tangible music objects are becoming so big that kids in their 20s are introduced to them as adults. I was making mixtapes when I was 7 years old and walking around with my recorder. I guess that derived from my mom traveling when I was in elementary school and we were living with my aunt and uncle. She really missed us, so we made cassettes of us talking so she could play them while she was in a different city and hear us, like cassette letters. I’d get really creative with it; talk to her; play my favorite songs. GD: Do you still have them? MC: I think my mom does. It’s interesting that we grew up with those physical mechanical objects, while kids today grew up with music only coming from a laptop or a machine without touching anything, and now they’re starting to deal with these circular objects. I’m interested to see how that makes technology develop in new ways. GD: I imagine that after the apocalypse, records will actually be the easiest things to listen to. Most of my material comes from secondhand shops. I’ve done installations with found tapes, and I did a project with a family’s whole audio journal from the the late ‘50s and early ‘60s. It seemed really sad to me that they’d spent so long recording their voices for posterity only for the tape to be dumped at a car boot sale. I spent a year tracking down the family from the information on the tape. People wouldn’t really record their whole correspondence like that anymore, because now we can do things in real time with Whatsapp and Skype and stuff like that. I had one cassette of a guy working on an oil rig talking to his mother about his wife, who was pregnant with their first child. It was just an unlabeled cassette I picked up in a charity shop. It’s interesting to piece together someone’s life like this. GD: Absolutely. I learned the hard way when a hard drive broke and I lost ten years of samples, photos and mixdowns. Do you have a record collection of favorite records or stuff you DJ? Have you ever smashed like, your first album or used some of your own things that are significant to you and your work? MC: Even though I love records and love working with them, they do disappear. I had one I loved so much that I didn’t even want to play it, even though my rule is to ruin what you love most. You can’t be dependent on things you love. This one record was a rare live recording of an amazing record, and I played a set at the Whitney Museum with Christian Marclay and left my records in this storage room where everything was supposed to be safe and fine. But sure enough, three specific records in my pile had gone, and that was one of them. I think someone went through and took some of my favorite things, and I think it was someone else on the bill because no one else could get in that room. It’s important to learn to let go, or things can’t progress. But you seem like more of a protector. GD: Yeah. I’ve always collected bits and bobs and interesting things I find. I like the idea of a collection or a personal archive. I’m quite protective over what’s important to me. That said, when I was in a band, I started a label and got a record pressed. I sold a few copies of our records to friends and stuff, but I was left with 250 under my bed. I was a bit embarrassed of it, so I had an installation where I invited people to smash them as a way of moving on. It was cathartic to change it into something new. I also use a lot of white-label techno stuff in the mechanical techno project, and they were all ones that I imagine someone treasured at some point. Maybe this exclusive white label was once the cornerstone of someone’s DJ set. It’s quite sad that it was discarded. I’ve also never been too precious about really collecting things, as most things I have bought have been secondhand or cheap or things I didn’t know if I would like. It’s very easy now to hear everything before you buy it. MC: I was also like that as a teenager. The culture was such that you searched for the best things and didn’t share them if someone asked about a record you were playing. “That’s my secret.” I did have a pretty good techno and house collection by the time I was 20. When I moved to New York City, my mom decided to have a garage sale and all my records were there. I’d taken my favorites with me, like French disco-house records that I still have, but when I went back to Houston to visit my mom, I was like “…where are my records? !” I think that was my first major experience of loss of something that I so coveted. It turned out to be a really good lesson, but at the time it was devastating. GD: I was watching Baby Ford DJ, and his set was quite smooth techno and minimal stuff. Then he dropped a garage track that was on an audibly lower-quality pressing, and there was something about this added texture. There were some really clear clicks and pops in it that other people winced at, but for me it was actually very refreshing to hear that in a club set. MC: That drives me crazy about the music industry; with sample and compression rates, they’re either creating a new “ear” in the listener or they’re not aware and are being really irresponsible! When you grow up with a very clean sound that doesn’t exist on vinyl, and then you use it as a DJ or performer, it doesn’t sound “right” anymore. GD: I wonder whether it comes back around, and the more that clean sound gets forced, the more people subconsciously rebel against it. People get bored when it starts to sound the same and look in different directions. At the moment stuff is more dusty and industrial, like the stuff coming out on Opal Tapes. People are prepared to listen to tapes again. Perhaps people are starting already to become less interested in that cleaner sound. MC: When I’m DJing, people get mad that I’m not playing a certain pop song that they need in order to feel comfortable enough to have a good time. That, to me, is a shame. The record industry has been forcing this Top 40 ideal so hard that people don’t want to look around for other sounds. The music industry has cultivated a “sonic hierarchy” based on what has been popular in the past. When we hear certain drum sequences in ’90s new jack swing music, they sound “old”—and they are—but that doesn’t make them irrelevant or useless. Do you think this sonic hierarchy is legitimate? Or do you think this is a social way of hearing? GD: Dance music is an interesting example of how sounds mean different things to different people. It’s really fickle in lots of ways, very of its time and it’s often very fashionable for a short period of time then seems very dated very quickly. It’s to do with the music industry but also wider society; the music that people listen to often defines the feel of an era for them. If that decade is seen as naff, then referencing those sounds will be unfashionable too. However, it’s easy to remove the context, especially in experimental music. When I sample records in the mechanical techno project, it’s normally a really small piece of sound—a fraction of a second—so it’s hard to tell where it’s come from. It takes it away from the context so it’s closer to a sound object. I think the way you work does this too. Perhaps the recorded music is your raw material, but through your process you create something entirely new. Read past conversations between Lee Gamble and Robin Mackay, Vinyl Terror & Horror and Author & Punisher and more.